I wonder why the vitriol to safcom which is Kenyan owned by Kenyans unlike Zain where all the profits will be sent back to india. Zain is charging 3 bob per minute but safcom is per second and its even 2 bob within the network. 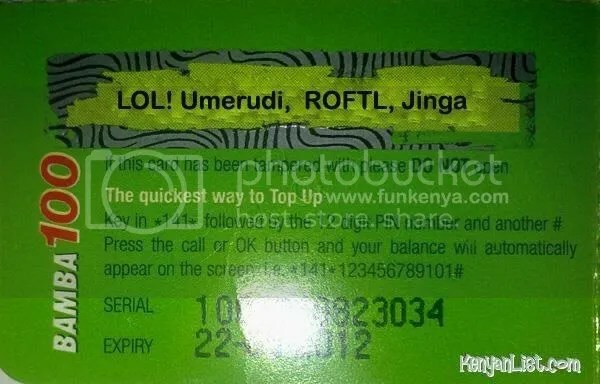 Lakini, wacha matusi iendelee before airtel formerly zain, formerly celtel, formerly kencell …. goes under and is sold to another investor. Safcom will continue to grow!!! As ususal Kenyans have shown their thirst for foreign owned products and services, and true to their fear (innovation). sometimes you wish everyone was as direct as Owuor above, why build an Indian firm (Indians have always taken advantage of Kenyans-case in point,mistreating their househelps) when we have a true Kenyan succes story? !